Around 1900 came the first in Binz Hotels and Holiday Inns. Just after the turn of the pretty houses in the style of resort architecture lovingly restored. In most hotels are again today - this way experience the holiday guests the charm of traditional summer while the spacious comfort of modern accommodations. Already in 1318, the town was first mentioned. Byntze was once the fishing village that is now the largest seaside resort on the island of R�gen. 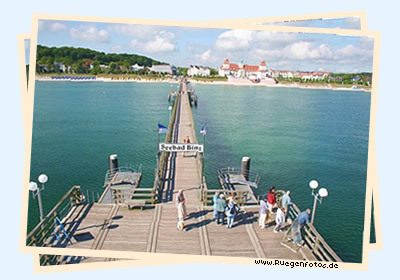 Binz that is one of the most popular vacation destinations on R�gen also has to do with its fashionable appearance. During a walk along the 3.2 km long beach promenade with magnificent spa, music pavilion and villas with balconies, turrets and bay windows , you can experience the history of the Baltic Sea. At the pier lay the excursion boats from the chalk cliffs, Cape Arkona on or in the other Baltic resorts. Chic boutiques and trendy sportswear shops or go shopping, but are also exclusive souvenirs as art and craft it on the "Art Mile" to buy. From uncomplicated holiday inn, cottage or an apartment complaints about the boutique hotels to state-of-the-art spa hotel in Binz vacationers find everything their hearts desire. The vast sandy beach stretches along the Prorer Wiek and the Baltic lies in the countryside - nestled in the narrow heath, the Schmachter Lake with his "Park of the Senses" and the forest of the Granitz, which is the hunting lodge of Prince crowned Putbus. 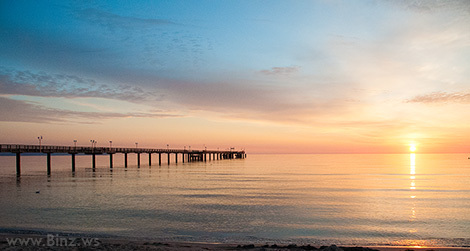 The mild climate with nearly 2000 hours of sunshine a year makes Binz a top destination in Germany. The ozone-laden sea air is the surrounding forest even healthier. 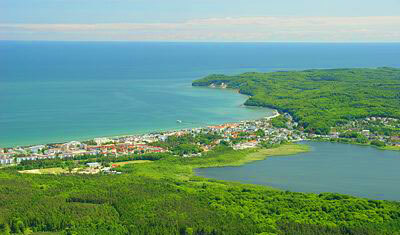 Because of its natural remedy is Binz also recognized as a health resort. Binz is far too rich in exciting excursion offers to lie on the beach. Sports and excursions are the perfect diversion for a lazy day in a beach chair and make Binz attractive year. The selection is huge - Binz has a real spa, swimming pools are to experience a sauna, solarium and fitness facilities are available in a wide selection. Special offers are available on contemporary wellness offers, medical wellness and programs for beauty and cosmetics are numerous. Those wishing to explore the natural landscape of the area, who can rent a bike or ride a horse. Especially the new electric bicycles "pedelec" allow excursions to the Southeast R�gen Biosphere Reserve, according to Sellin or G�hren. In these resorts also runs the historic narrow gauge railway " Rasender Roland ". Very close are the flint fields containing more than 3.5 km long former KDF-Bad Prora, a ropes course and numerous museums. The chalk cliffs in the Jasmund National Park and the Hiddensee are achievable destinations. Englisch Kinder Nachhilfe Binz und Englisch Camp Rügen.